08/02/06 – WD/BW – James River Kennel Club – Mrs. Michele L. Billings – 2pts. On October 24th Logres Tungsten went up to the Northeast with Kelly Marquis. Within less than a month he was finished. 10/27/06 WD/BW Queensboro Kennel Club – Mr. C Winslow – 1 pt. 11/16/06 – WD/BW Del-Otse-Nango Kennel Club – Ms. Rita J. Biddle Esq. 1 pt. 11/17/06 – WD Central New York Kennel Club – James E. Noe – 1 pt. 11/18/06 – WD Susque-Nango Kennel Club – Mrs. Shirley Bell – 1 pt. 11/19/06 – WD/BREED (over BIS Specials) – Chenango K. C. – Mr. Joe Tacker – 2 pts. 11/24/06 – WD/BW New Champion – Windham Co. KC – Mr. E. W Hall – 4 pt. major. Thank you Lance Deloria for starting Tungsten and a special “thank you” to Kelly Marquis for finishing him in such style! Tungsten starting winning before he really had a clue what showing was all about. In all, Tungsten was only shown four weekends to from start to finish. Tungsten won every weekend, winning his first 2pts WD/BW on August 2, 2006, his second time in the ring. Two days later Tungsten won a 4pt major (all in his first weekend of showing, with Lance Deloria). After that first weekend, Tungsten wasn’t shown again until we sent him up to Kelly Marquis on October 24, 2006. Tungsten picked things all up rather quickly, winning on October 27th and then winning his last six shows in a row, two of which were majors. He finished on November 24, 2006 with three majors. 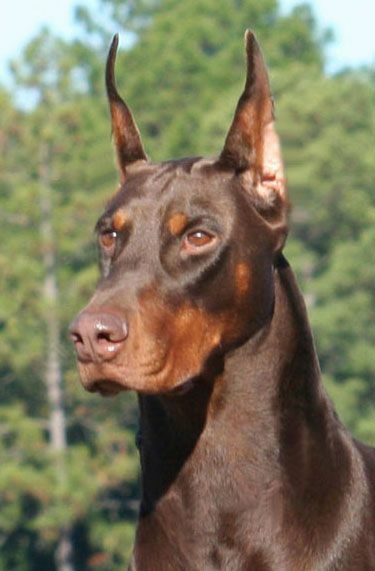 His second to the last time in the ring as a class dog, Tungsten won the Breed from the classes over three specials, including two of the top Dobermans in 2006, the lovely Multi BIS Ch. Marquis’ Yes I Am Charmed (a.k.a. Marley, shown by Kelly Marquis) and BIS Ch. Cha-Rish Star Quest Blu-J’s (a.k.a. Hunter, shown by Diego Garcia).